At long last Mercedes-Benz have finally ventured into the relatively new MPV segment in the middle eastern region with the debut of their all new V-Class. With the V-Class, Mercedes-Benz is redefining the MPV. As the largest member of the passenger car family from Stuttgart, it sets new benchmarks in its segment with its design and a host of innovations. With room for up to eight people, the vehicle combines exemplary functionality with the high-class appeal, efficient driving pleasure and a five star safety rating that distinguish automobiles bearing the three-pointed star. This makes the Mercedes among MPVs the perfect vehicle for those who appreciate great spaciousness, but do not want to sacrifice style and comfort. The V-Class is offered in three variants: Standard, Avantgarde and Exclusive. A particularly luxurious variant of the MPV is the V-Class EXCLUSIVE. With an incomparably high level of exclusive equipment and appointments, it raises style, comfort and functionality of the V-Class to an even higher level and marks the pinnacle of the model series. The V-Class AVANTGARDE option includes the option of an Exterior Sports package and an Interior Design package, and a range of other extras. 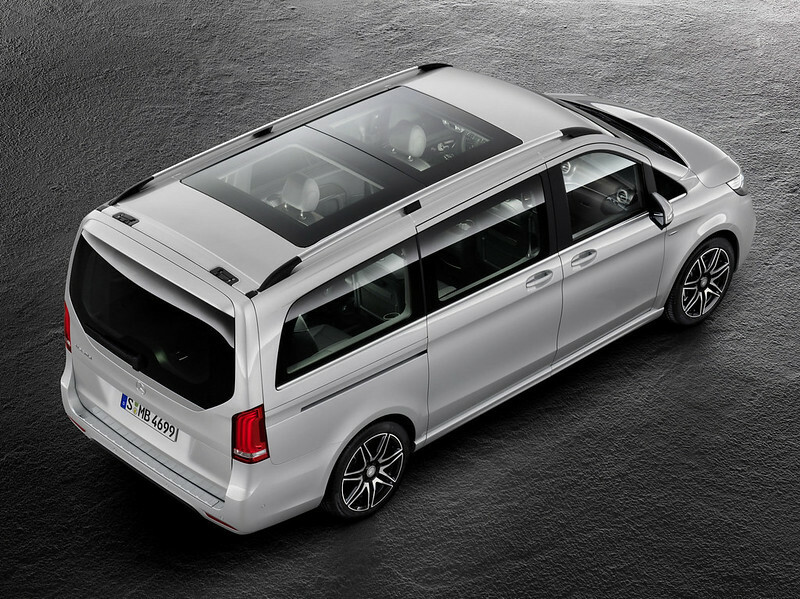 For the first time in this segment, Mercedes-Benz is also offering the AMG Line equipment package, enabling the new MPV to be individualised to suit any taste and requirement. As a result, the model meets a wide variety of customer needs and is just as attractive for families as it is for people who need a variable and spacious interior for their leisure and sports activities. Even more than that, it is ideally suited to use as a luxurious VIP or hotel shuttle. Even at first glance the V-Class is unmistakably a member of the Mercedes-Benz passenger car family and sets an emotional highlight in its segment. 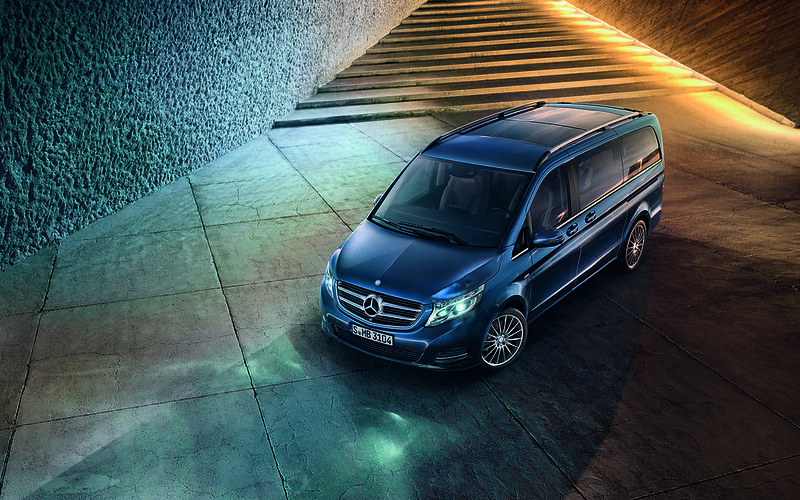 The new V-Class demonstrates that an elegant and dynamic appearance is also possible in size XXL. 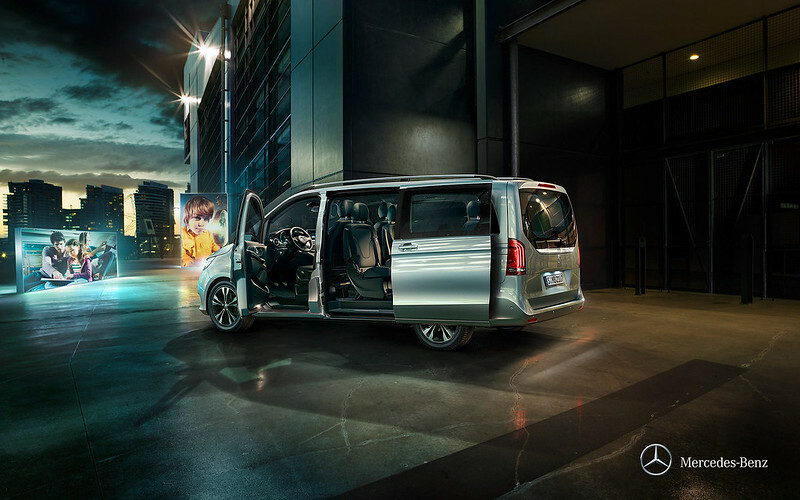 The V-Class is a versatile, multitalented vehicle that offers value, efficiency and safety at the highest level. As a result it is addressing a completely new customer group – among them those who are in need of a generous amount of space but never wanted to drive an MPV because style, a sense of well-being and also ride comfort have so far been lacking in this segment. A high level of driving comfort and an exemplary standard of safety are ensured by a total of ten innovative driver assistance systems. They are based on state-of-the-art radar, camera and ultrasound sensors, which were introduced in the new E-Class and S-Class under the name “Mercedes-Benz Intelligent Drive”. Standard equipment includes Crosswind Assist, which helps the driver to stabilise the V-Class in strong, gusting crosswinds, and ATTENTION ASSIST, which can warn of inattention and drowsiness. An available option is Active Parking Assist. It makes parking the new MPV as easy and convenient as parking a compact car. Also optionally available are the 360° camera, DISTRONIC PLUS adaptive cruise control with COLLISION PREVENTION ASSIST, Lane Keeping Assist, Blind Spot Assist, the LED Intelligent Light System and Adaptive Highbeam Assist. Most of these assistance systems are available in this segment for the first time. The interior of the V-Class is a completely new MPV experience. And not only because it is pleasantly quiet. High-quality materials with a pleasant touch and feel and a harmonious colour concept, intricate details as well as a progressive and sensuous design idiom convey outstanding high-class appeal in the segment – and that hallmark “welcome home” feeling typical of Mercedes-Benz cars. Fine nappa leather is also available for the seats, steering wheel and shift lever. This inviting atmosphere is rounded off by subtle ambient lighting in three colours. The V-Class also sets new standards in comfort and variability with a host of innovations. The Mercedes-Benz MPV is the only vehicle in the segment to offer optional 4-way lumbar support and active seat ventilation with reversing fans to ensure a consistent relative humidity at the contact area with the leather seat for driver and front passenger. Also unique in this class of vehicles is the enhanced THERMOTRONIC automatic climate control system, which is available in addition to the standard-fit TEMPMATIC system. It has various ventilation modes to offer individual climate control. The FOCUS, MEDIUM and DIFFUSE climate modes have distinct settings for air flow and distribution. 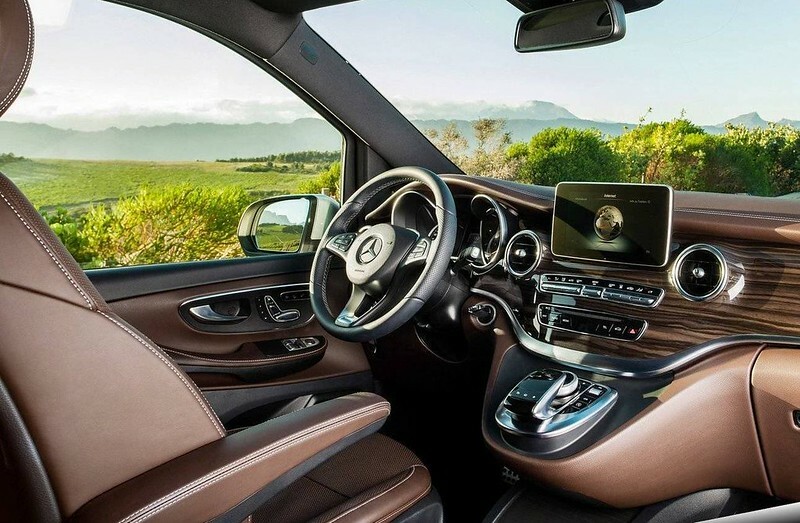 Even for hot climate regions, the V-Class climate control system ensures pleasant temperatures both in the front and in the rear part of the vehicle due to its ehanced cooling capacity. 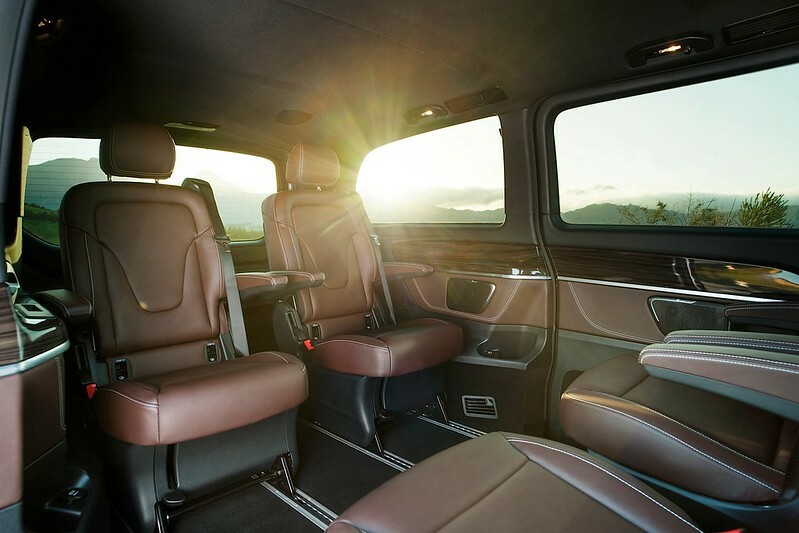 With additional optional extras like air-conditioned front and rear seats, large panoramic roof, iPad holders in rear and LED-illuminated thermo cup holders and the large centre console with integral cooler compartment, the V-Class makes all passengers feel as comfortable as in their living rooms.